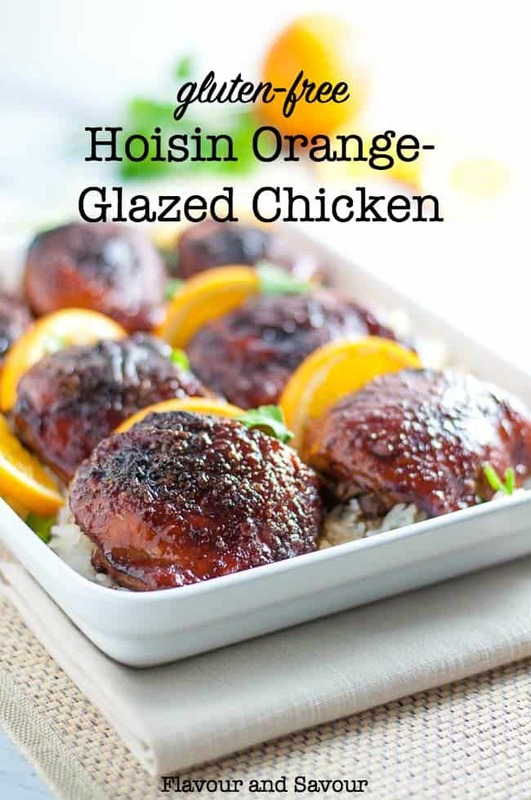 This recipe for gluten-free Hoisin Orange Glazed Chicken Thighs makes succulent, juicy chicken with hints of orange, ginger and garlic. 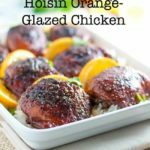 An easy recipe for baked orange chicken. 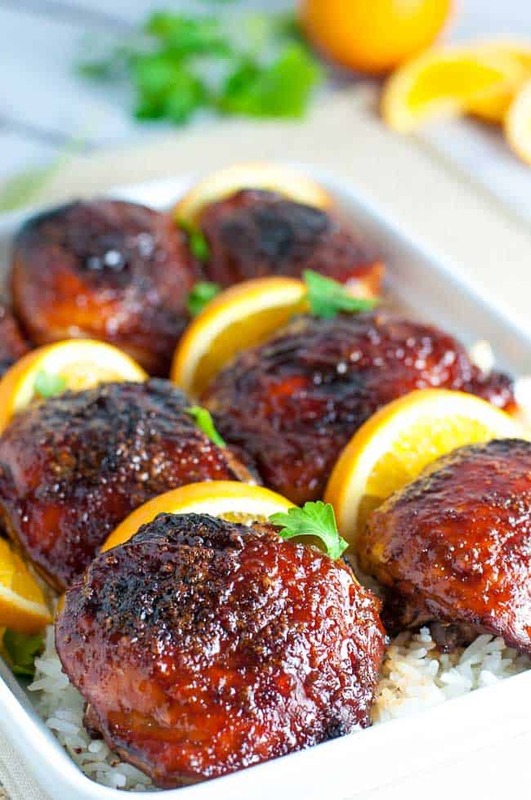 Don’t you love the burnished colour of these glazed chicken thighs? This Hoisin Orange Glazed Chicken has a beautiful balance of sweet and savoury. 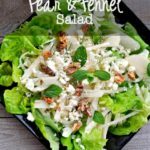 It makes an easy weeknight supper. 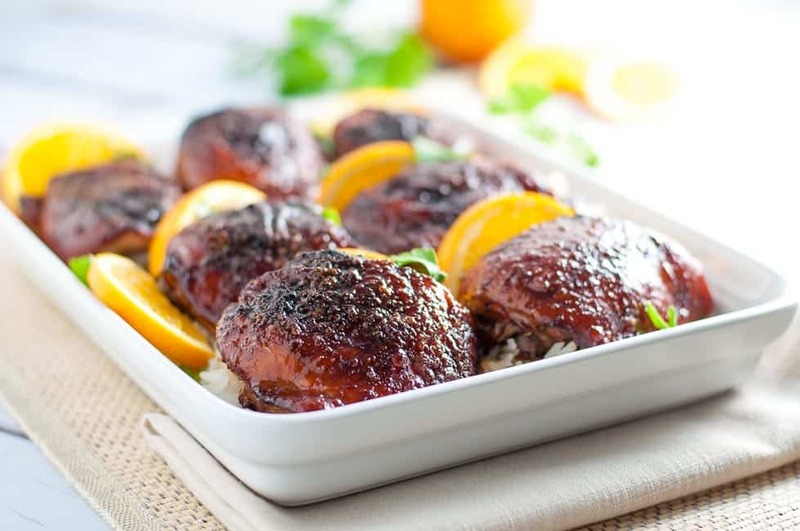 This baked orange chicken recipe would also be perfect for a simple dinner party, served over rice with steamed broccoli or other green vegetables. Someone once asked me what was the one food I could not live without. That’s an easy question for me to answer. A decade ago, when I was not well, there were a few foods I had to avoid. I had no problem eliminating them from my diet, didn’t miss them a bit, and never gave them a second thought. But oranges? To live without their sweet juicy, make-my-day-brighter deliciousness would sure be tough for me. I like oranges perfectly plain, for breakfast, in a healthy salad, in a muffin, for dessert, in a cocktail and even with chocolate! 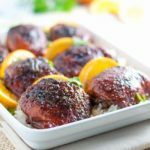 And in this recipe for Hoisin Orange Glazed Chicken Thighs, oranges add just the right amount of natural sweetness and acid to balance the saltiness of the hoisin sauce. put the chicken and the marinade in a resealable bag or container, marinate for at least 30 min. If you’re looking for a different way to cook chicken thighs, here’s an easy recipe that requires only a few ingredients and is quick to prepare. You could easily double the recipe, and if you’re using fresh chicken, freeze half together with the marinade for another day. 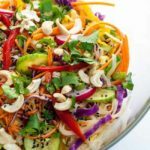 I served this over jasmine rice, quickly cooked in my Instant Pot, with fresh green vegetables on the side. It’s an easy weeknight meal. in large bowl, or food processor, combine hoisin sauce, orange zest and juice, coconut aminos OR soy sauce, garlic and ginger. Process or stir until smooth. 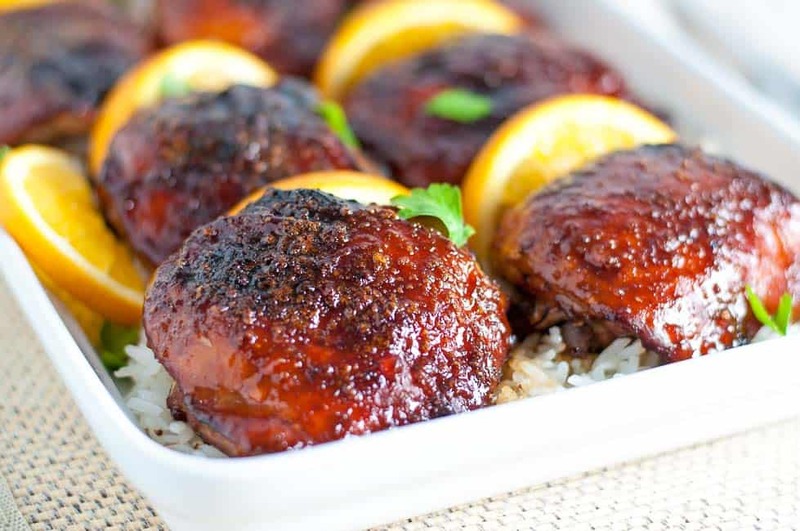 Put chicken thighs in a baking pan and pour sauce over. Marinate at room temperature for 30 minutes or in refrigerator for up to 4 hours. 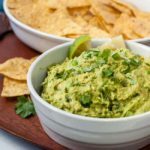 Remove from refrigerator 30 minutes before cooking. Pour marinade off into a jar or measuring cup. Place chicken skin side up in a shallow baking pan. Roast at 375°F for 20 minutes. Stir honey into marinade and spoon over chicken. Continue roasting for another 20 - 30 minutes until chicken is no longer pink inside. Serve over cooked rice or with vegetables of your choice. Garnish with fresh orange slices. 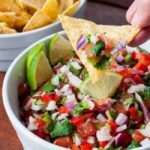 If you like a little more heat, add a teaspoon of your favourite hot sauce to the marinade. Looking for more chicken inspiration? Check out over 50 more chicken recipes here on Flavour & Savour. I could probably live without oranges…but why would I want to? This sounds like a great dish to have as a last minute chicken dish arsenal! Thanks Bernice! Yes, it’s a quick one! This chicken looks just divine! Oh man I wish I could just grab one and bite into that caramelised crust! Yum! Thanks! We love this dish. So easy! This looks beautiful and delicious! Love your photos. Thanks for the recipe. I’m going to serve this with Trader Joe’s chicken fried rice for an easy, tasty meal. Oh! That sound like a great idea! I love fried rice.